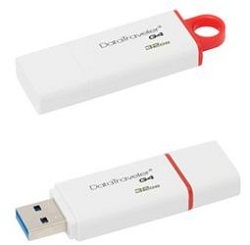 Kingston's DataTraveler Generation 4 (DTIG4) USB Flash drive features USB 3.0 for quick and easy transfers of music, video and more. Its practical design and bright color makes it ideal for everyday use at work, home, school or wherever you need to take your data. It's backwards compatible with existing USB 2.0 ports, allowing 2.0 users to migrate to 3.0 in the future without replacing their drive. DTIG4 is backed by a five-year warranty, free technical support and legendary Kingston reliability.